Rob Kearney will remain at Leinster until at least June 2018 after agreeing a three-year contract extension with the Irish Rugby Football Union. Kearney, 29, was under contract until 2015 and the new deal will keep him at Leinster until past his 32nd birthday. 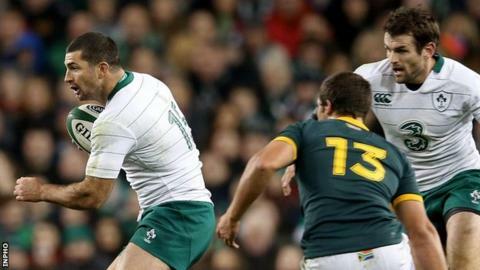 The Louth-born full-back made his Ireland debut in 2005 and won his 56th cap for his country in Saturday's win over South Africa. "It is a great honour to extend my contract," said Kearney. The Leinster player played in all three British and Irish Lions Tests against South Africa in 2009 and also toured with the Lions in Australia last year. He was part of Ireland's Grand Slam winning squad in 2009 and also played in Ireland's Six Nations triumph earlier this year. Kearney has helped Leinster clinch three Heineken Cup titles in addition to three Pro12 triumphs and an Amlin Challenge Cup win. Leinster chief executive Mick Dawson spoke of his delight at Kearney's contract extension. "Rob is a senior international with a proven pedigree and a key voice within our environment," said Dawson. "Keeping our stars at Leinster will ensure that we continue to compete for silverware in our domestic competition and in Europe." Kearney's brother Dave is also part of the Leinster squad and joined him in Ireland's Six Nations-winning squad last season.